Man Utd host Crystal Palace at Old Trafford on Saturday afternoon, and there’s good news on the injury front for Jose Mourinho, as per reports. The Red Devils will be looking to bounce back from their disappointing defeat to rivals Man City prior to the international break, as they continue to also languish in eighth place in the Premier League table. 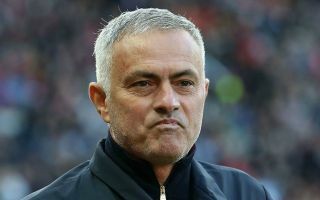 From the 12-point gap to leaders City to being seven points adrift of the top four, Mourinho knows his side can ill-afford to drop more points especially ahead of a busy festive period. In turn, he will be buoyed by the updates on three key players, as noted below by freelance injury analyst Ben Dinnery, as Anthony Martial and Diogo Dalot were pictured back in full training this week, while Victor Lindelof has overcome concerns over a possible injury setback by playing 90 minutes for Sweden on Tuesday. With that in mind, it would suggest that the trio will be available to face Palace this weekend, giving the Portuguese tactician additional options to ensure that his side get the right result. As for Palace, Roy Hodgson is potentially set to be without a key figure of his own as Mamadou Sakho is said to have picked up a back problem in France’s win over Uruguay, making him a doubt for the trip to Old Trafford. The 28-year-old hasn’t missed a minute of Premier League football so far this season, and so his absence will be a blow for the Eagles if he is indeed ruled out. Anthony Martial and Diogo Dalot return to full training. Victor Lindelof [illness] played 90 minutes [and scored] as Sweden beat Russia 2-0 on Tuesday. Mamadou Sakho has emerged as an early doubt for the clash with Manchester United on Saturday after a back problem forced the #CPFC defender off during #FRA win over Uruguay on Tuesday. He will be fully assessed on his return to Selhurst Park.